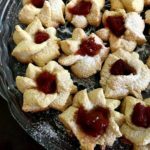 Shortbread thumbprint cookies filled with quince jam and sprinkled with vanilla sugar, so soft and tasty. Grab some now, before the cookie monster eats them up! 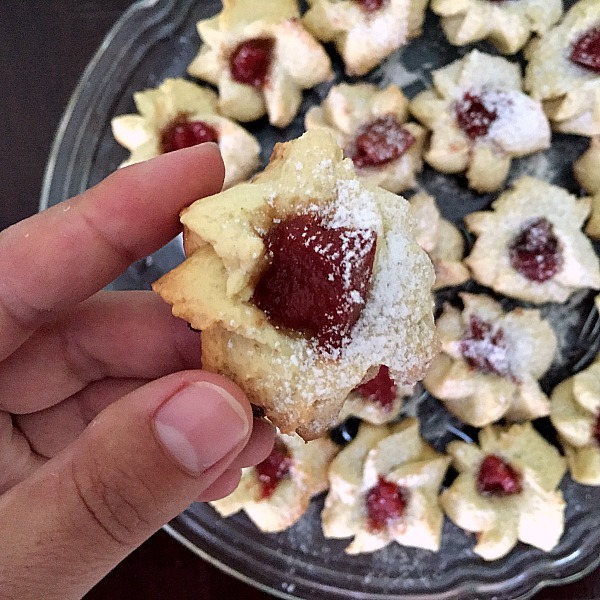 I’m not trying to brag, but these shortbread thumbprint cookies are out of this world! You know me, l do have quite a sweet tooth, unfortunately. I must thank Mother Nature that, in her kindnes, she cast a spell on me to keep fit despite the fact that l eat like a horse. I know, how lucky! I don’t usually buy jams or preserves, it rarely happens that I do, in which case I either have some on toast with some butter, or make some nice cookies. 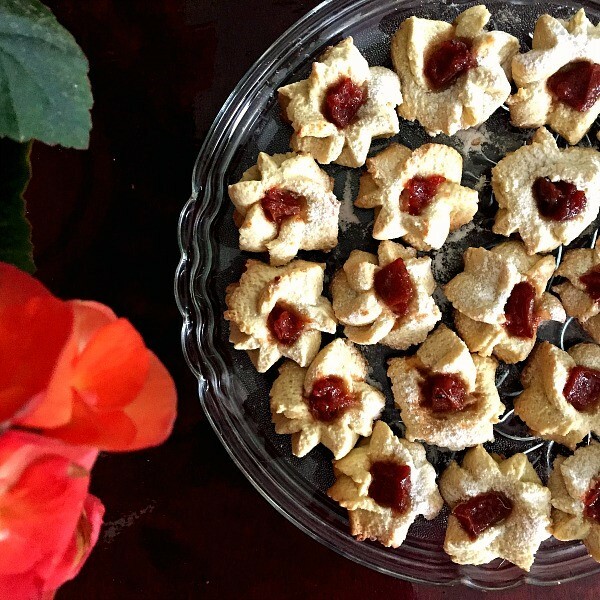 And these shrotbread thumbprint cookies are using the best jam you can possibly ask for: quince jam! Not many people are familiar with these fruit, but quinces are the best Autumn fruit for jams. Mum always makes a huge batch of quince jam to last throughout the winter. 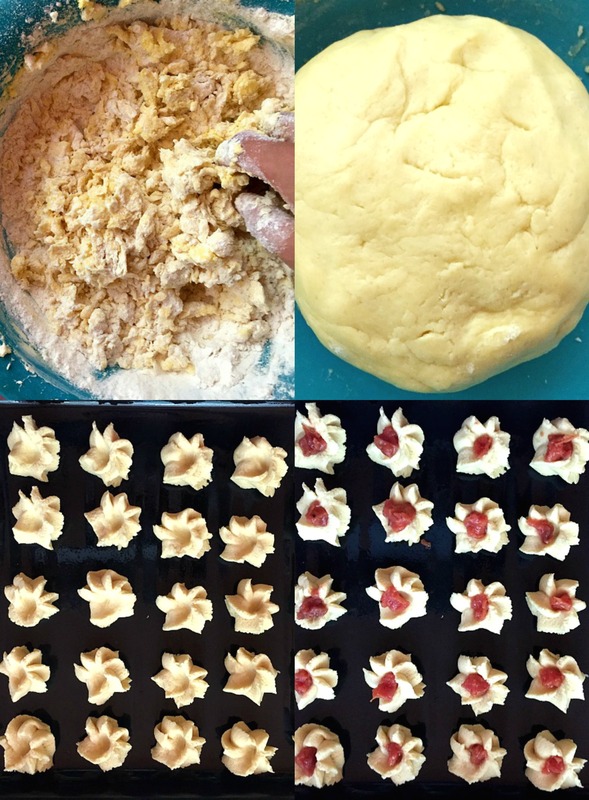 Making these shortbread thumbprint cookies takes less time than it would take you to go to the corner shop and buy some nibbles. Some planning in advance would help actually, as having the ingredients at room temperature is what makes these cookies the softest, best cookies ever. If you don’t have quince jam, feel free to use any other jam or Turkish delight. Do you remember my Crescent rolls with strawberry jam? This quince jam would have worked really well with them too. Right, no more wasting time, let’s roll up the sleeves and bake some cookies! They make a fantastic choice for parties, since one batch gives you lots of cookies. No need to spend all day in the kitchen baking, when these can be done so quickly. Along with other cookies, these have certainly marked my childhood. Mum used to make them pretty often, not only because they were delicious, and pretty cheap with a few ingredients, but also because of the amount. We all could indulge until we were about to burst, and they were amazing every single time. All of us, from little to grown-ups absolutely loved them, and we still do today. I’m yet to make them for my little one, l’m sure she’d love them, she’s mummy’s girl for sure, with a good sweet tooth already. 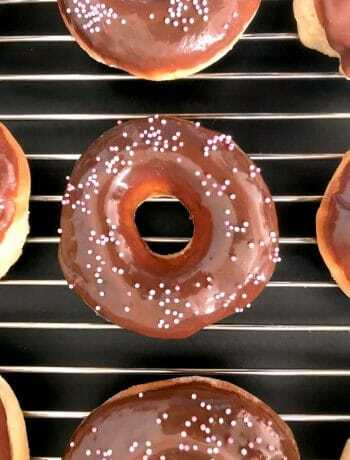 I do try to omist her sugar intake though, so these would definitely be like a treat now andd then. 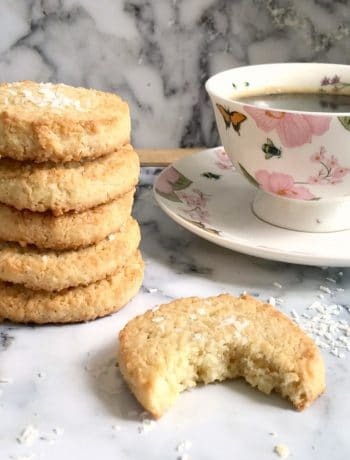 If you’ve liked my SHORTBREAD THUMBPRINT COOKIES or any other recipe on the blog then don’t forget to rate the recipe and let me know how you got on in the comments below, I love hearing from you! You can also FOLLOW ME on FACEBOOK, and PINTEREST to see more delicious food and what I’m getting up to. 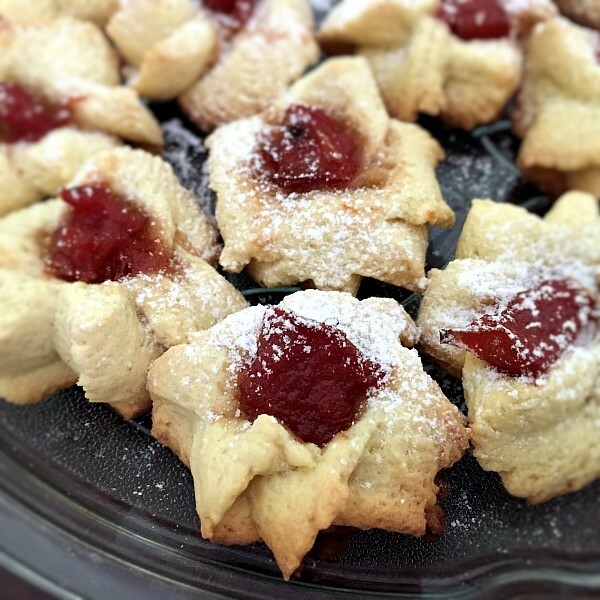 Shortbread thumbprint cookies with a delicate vanilla flavour, excellent party treats ideas. Super easy to make, and easy to feed a crowd. 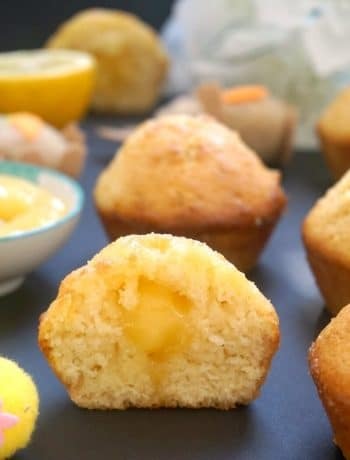 Cut the butter in small cubes, add them to a bowl together with the icing sugar and beat them with an electric hand mixer until you get a smooth paste. Add the egg yolks, and beat for a further 30 seconds until the egg yolks are fully incorporated. Time you got the hands dirty: add 1 sachet of vanilla sugar, vanilla extract and flour and, using your hands, mix all ingredients together until you get an easy-to-work-with-dough. Depending on the size of the eggs, you may need to add more or less flour, the dough should not be too hard, but neither too sticky. If the dough comes easily off your hands, then it has got the right consistency. So I would just add 250 grams of flour to begin with, and add more if needed. Oil a rectangle baking tray. Using a large nozzle piping bag, pipe some dough on the baking tray, then gently press with your thumb in the middle of the cookie. Repeat until all the dough is finished. Fill with quince jam, then bake in the oven for 20-25 minutes, depending on your oven. Sprinkle some vanilla sugar over the cookies. Ahh, they were a childhood favourite of mine! Thank you, Jane! They are indeed favourite among little ones, fun to make and also tasty. I love how pretty your cookies look. Using the star nozzle is so much better than blobs, great idea! I love fig jam and it is underrated in my view. So anything with fig jam in the recipe immediately grabs my attention. These little cookies look great and I don’t think you are bragging, they do look awesome. I can just imagine little hands reaching out for these – big hands, too, come to think of it. They look incredibly pretty, and the dough sounds a little like the type used for the Melting Moments recipe. I haven’t made them for years, so I can’t quote the exact recipe, but it was a very soft, melt-in-the-mouth result, like these. Lovely shape, too, Daniela. Thank you, they are incredibly soft and they keep ok for a few good days.